New Product demos on Ausley's 1966-67 radios. 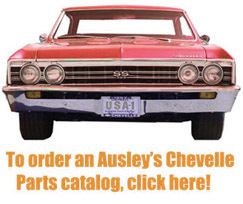 New Product demos on Ausley's 1969-72 radio. Ausley's also attends between 20 and 25 car shows each year. From Daytona Beach, Florida to Englishtown, New Jersey and as far west as Indianapolis, Indiana, you can pre-order your parts and pick them up at any of the shows we have listed on our web-site under our show schedule link.